Willis “Thomas” Carpenter III, 75, of Washington Island, passed away at his home on Friday February 8, 2019. He was born on February 17, 1943 in North Carolina, the son of the late Willis T. and Victoria (Black) Carpenter Jr. Tom was married to Valerie (Marsden) Carpenter. They lovingly shared their lives together for 36 years. Tom was a master carpenter by trade and was dedicated to his craft until the end. He specialized in antique barn construction. He had an exceptional set of skills regarding the use and application of 18th and 19th century wood working tools. He was well-known for his barn construction expertise. His many finished works of strength, skill and beauty accentuate his property as well as places on the Island and in Pennsylvania. These structures stand now as memorials to this wonderfully talented man. In addition to being survived by his wife, Tom is also survived by two daughters, Rachael (Schell) of Aspinwall, PA and Jessica (Scott) of Trafford, PA; brother, Kenneth Carpenter; and a nephew, both of Arkansas; and five adoring grandchildren in Pennsylvania. Tom was preceded in death by his parents; son, Andrew Carpenter; and daughter, Gretchen Carpenter. A celebration of Tom’s unique life will be held on a later date. In lieu of flowers, donations can be made to the Washington Island Farm Museum. 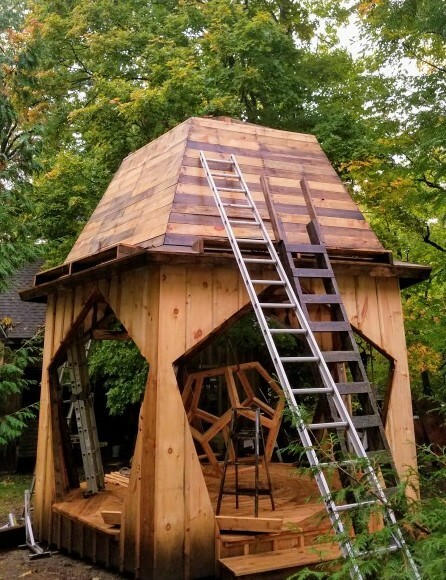 A portion of your donations will be used for the completion of Tom’s latest project: “The Gazebo”. Huehns Funeral Home, Inc. & Door County Crematory LLC are assisting the Carpenter family. Expressions of sympathy, memories, and photos of Tom may be shared with his family through his tribute page at www.huehnsfuneralhome.com.